Truck Shelters, also known as Dock Shelters, come in a wide variety of sizes and models making them the most versatile truck to dock sealing product on the market. Unlike Dock Seals designed to close an opening down to 7'6", Truck Shelters provide full access to the trailer opening width and height. This speeds up loading and unloading the rear of the trailer while reducing damage caused to your seal. The seal is set through the use of hanging curtains with spring steel stays designed to slide along the outside of the trailer as it docks, thus providing an effective weather seal regardless of the trailer size. 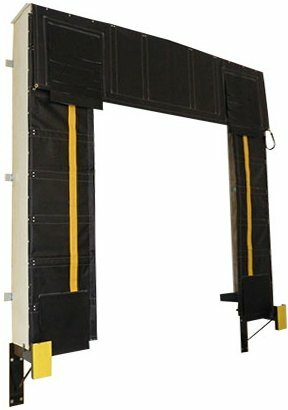 In addition to a variety of options and addons, there are three types of frames offered through Loading Dock Supply. Fill out a Dock Shelter Survey today! Loading Dock Supply, LLC prides itself on being available to discuss your needs give us a call and we'll help you choose the right seal for the job 1800-741-1258. To determine a proper position for the Truck Shelters steel bumpers take the width of the header (Dimension A, Fig. 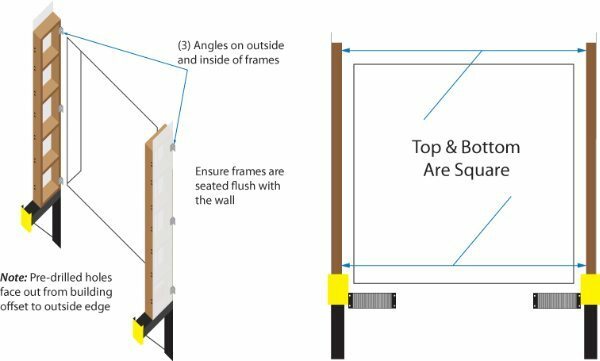 1, 11’6” is standard; measure your header width to confirm this), and find center line of door and measure outward 1/2 of unit width; add an extra inch on each side (See Fig. 1). This will give you the outside edge of Truck shelters steel bumpers. Outside-to-Outside of bumpers will be width of unit, plus two inches. install so top of bumper is level with dock floor. Check each Truck Shelter vertical frame for the markings LB (Left bottom) and RB (Right Bottom). Match the curtain to the proper shelter frame by placing the curtain over the vertical so the longest end is on the outside edge (The side the pre-drilled holes are offset to). At this time ensure the bolt holes align properly. If the holes do not line up your verticals may be upside down, or you may have the opposite curtain. For reference later make sure to mark the top and what side the frame is for. in the drawing to the left the hole displacement on the vertical frames are towards the outside edge. The longest end of the curtain will align with this edge. Set Dock Shelter verticals in position on top of steel bumpers. Make sure the verticals are level and square with the back flush against building. Outside-to-outside measurement of verticals should be the same at top and bottom; same as your headers width (See figure 3). 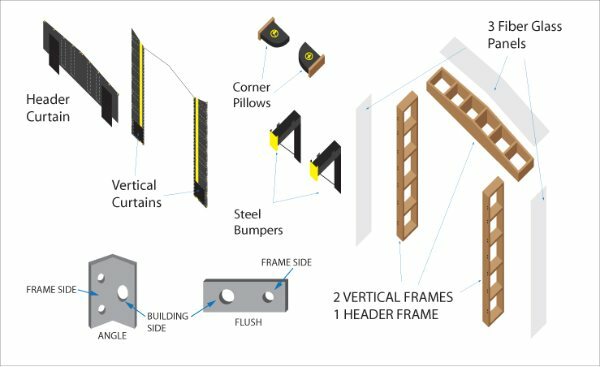 Attach each rigid vertical to wall with six of the angle brackets supplied; three inside three outside. Use provided lag screws with 3/8” washers to attach the base of verticals to the steel bumpers. Attach translucent fiberglass light panels to rigid verticals using nails provided. The fiberglass Light panels are three inches longer than the Truck Shelter frames. Attach the vertical panels to the side of vertical frame the pre-drilled holes are displaced towards. When attached, the fiberglass will over hang the top of the frame approximately 3”. Note:Remember to double check your panel placement before securing, pre-marking the top of the frame as RT and LT will help with this. Attach translucent fiberglass light panels to the sloped top of the Truck Shelter Header Frame using nails provided. The fiberglass Light panel is three inches longer than the vertical frame and should hang 1-1/2” over each end. Set rigid Header in position on top of vertical frames and attach to mounting surface with six of the angle brackets supplied; three on top and three on bottom. Use provided lag screws with 3/8" washers to attach the Header frame to the top of the vertical frames with provided flat brackets. The vinyl verticals, vinyl Header, and rigid frames are pre-drilled for easy assembly. Place vinyl verticals on the appropriate (left or right) rigid vertical so the bottom is even with the bottom of the rigid vertical. The tops of the vinyl verticals slope downward toward the center of the door (see fig 5). Line up pre-drilled holes on the front of the verticals and tap in 1/4” carriage bolts which will protrude through the 2x4. Place washers and nuts on bolts and tighten. Repeat this step for all remaining pre-drilled vertical placements. Take vinyl around corner of vertical and attach to outside of rigid vertical by driving nails provided through grommets, repeat on other side. Lift vinyl header into position, Over the vinyl verticals (see fig 5). Line up pre-drilled holes and tap in 1/4” carriage bolts which will protrude through 2x6. Put washers and nuts on bolts and tighten. 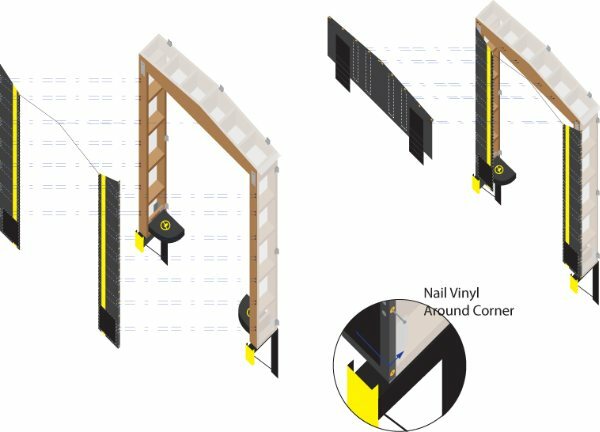 Take vinyl cover of header and attach to the outside of rigid header by driving nails provided through grommets into rigid header. Screw the eye into the pre-drilled hole in the center of the bottom/front of rigid header frame. 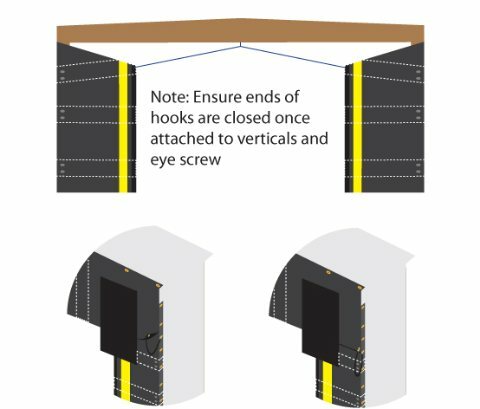 Connect the rubber straps from the screw eye to the grommets on the top corners of the vinyl verticals (See fig 6). End of strap with regular S hook goes to screw eye; end with extender hook goes to vinyl vertical. Close the hook once placed to ensure securement. 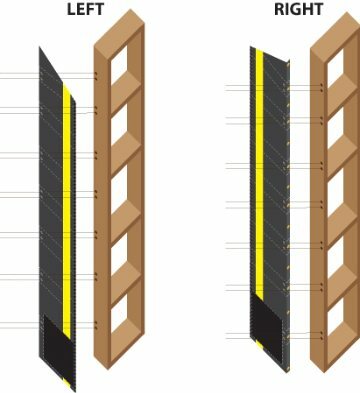 Attach the rubber straps that are connected to the bottom corners of vinyl header to the face of the rigid verticals, directly under the corners. 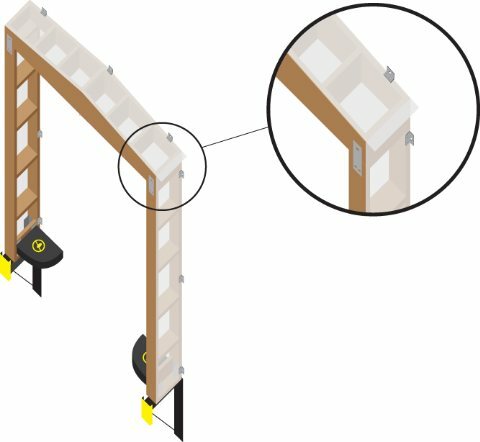 Note: that the strap hangs in a loop when the header is close to the Dock Shelter verticals (see fig 7). Close the hook once placed to ensure securement. 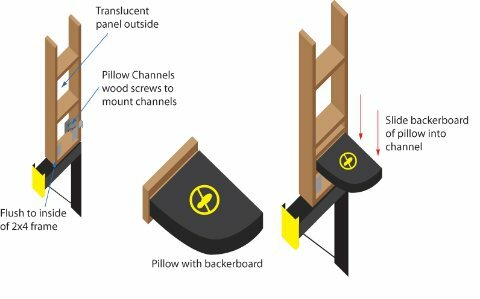 Attach the pillow channels to inside bottom of rigid verticals, just above the angle brackets and flush with the inside edge of the 2x4, away from the translucent panel. Use 1/4” wood screws provided (see fig 8). Slide backboard of pillow into channel.